The Best Acoustic Act on the Planet! From Rock to Reggae, Classic to Current, you'll hear it!! Come Sing And Dance With Us! Quigley's Irish Pub - Thursday, April 18th at 7:30pm! Our Addiction Is Your Entertainment! From your local bar to your living room, backyard or Banquet Hall, we got you covered! "I have booked the Acoustiholics for fund raisers benefitting several non-profit organizations I work with. Not only were they friendly and accommodating to our needs and requests but Len and John put on a great show. The Acoustiholics played a wide variety of music. My guests from events such as a golf outings to paint night fundraisers were entertained and many asked for contact information so they could book Len and John for their events. I look forward to partnering with the Acoustiholics in the future!" 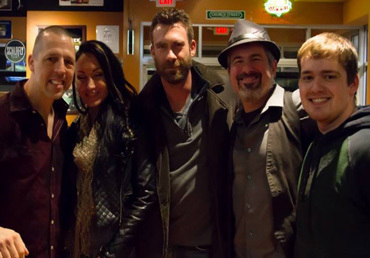 "The Acoustiholics have played several events for us, with guests up to 300 and they were an overwhelming success. They are extremely talented and diverse musicians and have made our parties very special. We highly recommend them!" 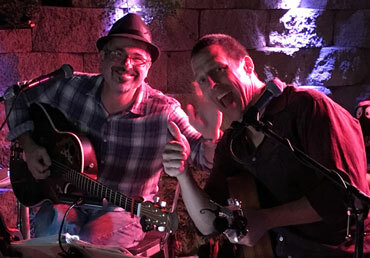 "If you’re looking for a fun and unique way to provide your guests with some awesome live entertainment, The Acoustiholics are truly the best! My sister and I threw my parents a 50th birthday bash at our home and we wanted to make their birthdays extra memorable. The night of the party, everyone was raving about how awesome the performance was! The Acoustiholics made my parents’ birthday bash a night to remember as everyone sang, danced, and enjoyed each other’s company. 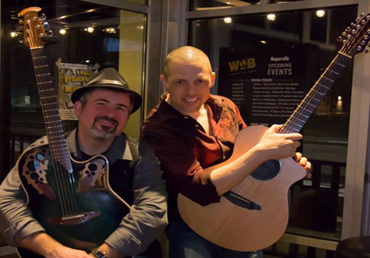 We would definitely recommend booking the Acoustiholics for any event for an awesome acoustic live performance!" "The Acoustiholics are absolutely amazing!! We have had Len and John at our annual Christmas Party for the last few years and they truly make the party. Their talent is phenomenal, their fun personalities are contagious, and they truly bring the party to a completely new level. We are so grateful to have met them. Trust me you will not be disappointed. Looking forward to many more parties with Len and John!!!!!" "The Acoustiholics are really the best acoustic act EVER!!!! We had them at our Summer Backyard Bash this past weekend. Len was easy to work with in booking our party. He went out of his way to make sure they played songs we requested, he provided us a extensive playlist to choose from. They arrived and set up their equipment on time and started entertaining us….We had a big crowd and they covered a wide variety of music from different genres…..Rock, Pop, Country music from the 70’s to today. My friends and relatives can’t stop talking about how much fun the party was, especially the live music by Len and John. They are very talented musician and have a passion for performing! I highly recommend The Acoustiholics for your next event——You won’t be disappointed." "I recently booked the Acoustiholics for the second time for a subdivision block party. I was happy and excited that they were available for my date as they were a crowd favorite after the last time they played. The Acoustiholics play such a diverse and great selection of songs that they had everyone in the crowd from age 5 to age 80 singing along. This second time we booked them, we added the optional drummer to the group for the night. But they were excellent as a duo and a trio. The price for either the duo or trio doesn’t break your budget and you get professional musicians with a professional experience. The guys showed up in plenty of time to setup, they brought their own sound and all the equipment they needed. They fit into a 10x20 tent, with plenty of room to spare and we able to project enough sound so they could be heard by the entire crowd in the park. They interacted with the crowd, took requests and made sure everyone was having a good time. I hope to get the opportunity to book or see the Acoustiholics again soon. Great songs, great time and a great experience for everyone." From your local bar or festival, to your living room, backyard or Banquet Hall, we are perfect for any occasion that calls for music from the 60's to today! We truly enjoy playing songs that everyone relates to, the songs they grew up to, to songs they dance to, and the songs they sing along to! Our biggest compliments comes from everyone, young and old, who dance, sing, or just tap their foot along with us! Chicago and surrounding suburbs in IL!